- Next, from ministerial affairs to the sports minister’s career record. You are a real Colonel, aren’t you? - Very true, though I am already a retiree after twenty years of service. My whole sports career was in the Central Sports Army Club – the CSKA. I’ve always performed for my club and even participated in international competitions held for teams delegated by the armed forces of the Warsaw Treaty member-countries. In the past there were rather impressive world championships for military personnel. It was a great time, indeed. Those days are still one of the most pleasant memories of mine! I was drafted into the army in 1987. Two years later I decided to go ahead with my military service as a non-com officer. I was promoted to Colonel in 2005. After the world championship, where I won my fifth gold medal. I was the sole competing athlete having such a high military rank. Vladislav Tretyak is a Colonel, too, but he was promoted when his career of an ice hockey player was over already. As for me, I went on competing for three years more. I received my shoulder straps from the minister of defense personally. The Armed Forces have always paid great attention to sports. Being a CSKA athlete was a matter of prestige and ‘real cool’. - And beneficial from the material point of view. I guess the stars of a commissioned officer on your shoulder straps also meant you were entitled to a decent monetary allowance? - It was up to you to choose where you would like your money to come from – the Soviet Union’s National Teams Training Center or your club. There was no way of getting double pay. None of us had thoughts like that, though. I was brought to the CSKA when I was nine. Before I’d tried myself in many different sports. I started with figure skating, then there followed swimming and ski jumping. One day I saw some feature movie – not about ski jumpers, but about Alpine skiers. Lots of snow, sharp turns, breathtaking speed and nice sports gear… The sole place in Moscow for Alpine skiing in those days was the Vorobyovy Hills, in the city’s southwest. It turned out that at the age of nine I was already too old for Alpine skiing. There remained the ski jumping group. I tried but did not stay long. Taking a jump was a scaring experience. Very scaring! You go up, then you look down from the top to see an abyss under your feet… In a word, I failed to take off. - Where did you live in Moscow? - In a little street in the city center near Patriarch Ponds. And I went to a very prestigious school in my neighborhood. I was admitted without any problems. No cronyism or nepotism, though my parents were ordinary engineers with no high-ranking connections. Our house was next door. That was enough. And my daughter went to the same school, too. And then my son… The school was excellent in all respects and requirements to be met there were very high. Not the slightest laxity was permitted. Poor academic performance was a disgrace. - Do you keep in touch with your classmates? - We’ve been friends for forty years now! We talk by telephone now and then. And each Friday we go to a steam bath. At a fixed time and to Moscow’s same best steam bath, Sandyny. We know everybody there and everybody there knows us… It’s a well-established custom! These days I am very busy at work, so occasions when I can stay there for two hours in a row are rare. Not the way it used to be. I usually come a little bit later. In our group I’m not the only one who is so busy. Life turned my pals different ways. One runs an industrial plant, another has a major advertising agency of his own, but by and large all are quite successful people. None of them has gone astray. Let me say once again – ours was a good school. But let me finish the story about my first days in fencing. It was very good I was already nine years then. At this age you are no longer a little kid and you begin to understand what you really like and are fond of. Literally from the very first day I realized: that’s where I belong! - Was it your dad who brought you there? - I went there on my own. To keep a friend of mine company. 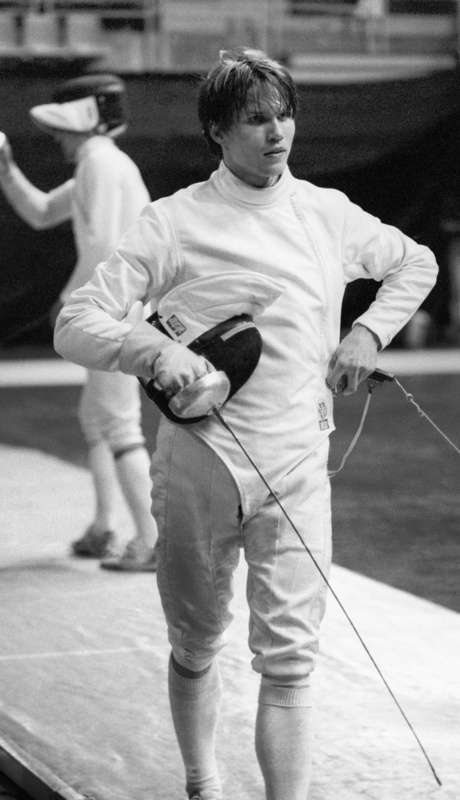 I had a friend, Oleg Skorobogatov, whose dad was a member of the Soviet Union’s fencing team. He told us: come on, boys, join in instead of fooling around. We agreed. Oleg was rather successful, too. 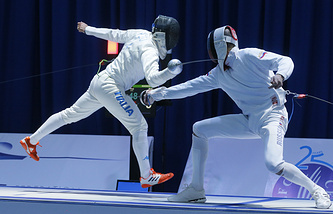 He won a youth world championship and was invited into the national adult team. For two years we went to different competitions together and performed on the same strip. It is good to have someone by your side to compete with. It’s an extra incentive and challenge. This is so not only in the world of sports. For some time Oleg and I went neck in neck. At one tournament the victory was his, and at another, mine. - But eventually you outperformed your friend. - Motivation is essential. At a certain point Oleg decided he had some other goals and interests to dedicate himself to. As for me, I could not imagine myself outside sports. I could see no other future for myself. Although I must tell you quite honestly that I’d never dreamed of becoming a world champion, let alone winning an Olympic gold. I knew too well how tremendously hard it was. It is true that since the era of Grigory Kriss Soviet athletes had not risen to the top of the podium. Apparently our coaches decided to keep a reminder of this in front of us all the time in order to motivate us and to make us seek high goals. Let me say once again, in those days it never occurred to me that I would grow up to put an end to this dark period and to win a gold for my country. I was making steady progress, step by step. I knew: the higher you fly, the harder you fall. First, I won a youth tournament in Moscow. At sixteen I participated in the Soviet Union’s adult championships to place 27th among 94 participants and qualify for the national team. It was then that I received my first full set of the fencing gear. I was happy. - Did you hear ill-wishers whisper enviously behind you back the Adidas gear was too good for an upstart like you? - Nobody even dreamed of Adidas in those days! All fencers then wore sports clothes provided by a government-run agency responsible for manufacturing all sports gear in the country. Its woolen suit looked most exquisite to me. I wore it all the time. And the CSKA club’s uniform was great, too. It was dark blue, with wide white trouser stripes and the CSKA logo on the back… Incidentally, that font is now back use. A very correct decision it was. Why neglecting what is really good? - What country did you go to first? - When I was in my eighth year in school I first went to Hungary, and then East Germany and Czechoslovakia. That was in 1984. For the trip I was required to get a written permission from the district office of the Young Communist League. I went there for what can be described as a political maturity and outlook interview. I had to spend some time reading up for the exam. I still remember that Hungary’s leader was Janos Kadar and East Germany’s number one was Erich Honecker. Utterly useless information. I still see no reason why I was obliged to memorize it. In 1988 I went to my first Olympics in Seoul. I was just 18! At the beginning of that season it had been just inconceivable. True, in 1987 I managed to win the youth world title, but adult sport implies a quite different level, a different attitude and rivals. Besides, competition inside the Soviet team was incredible. Each Soviet republic presented its own group of candidates. So did Moscow and Leningrad. At the Soviet Union’s national championship rivalry was so strong that getting into the list of the best 32 was considered a great success. Competitions lasted for two days – a very strenuous tournament it was. I’d won several important victories before the Olympics and I thought that I passed the test and was physically and psychologically ready for competition and strong pressures. But the Olympic Games were so different! I had to readjust myself on the fly. On the other hand, the tremendous surge of emotion was very helpful. Everything around looked wonderful! I remember the day when in the Olympic village I met the Soviet basketball team led by Arvidas Sabonis and Aleksandr Volkov. Before I’d seen them only on TV. Now they were in front of me in real life. I was looking up at them from a distance, too shy to come up. Even my fellow athletes in the fencing team made me feel shy. And I knew none of the guys in the sabre team. By that time they had already won the world title, while I was still a new-comer, a debutant. I felt awkward and not quite at home, but in the tournament I performed well enough. Although I could’ve done much better. In the semifinals against the French I won one fight and lost another. I also participated in the match for the bronze. I still remember every single hit I made. In the end I gained colossal experience. Our team won the bronze. It might seem it was an occasion to celebrate. At the age of 18 I became an Olympic medalist. But for the team it was a disaster. We were so upset that we did not even congratulate each other. - I was not alone there. I was a member of the team. The team had been determined to win. 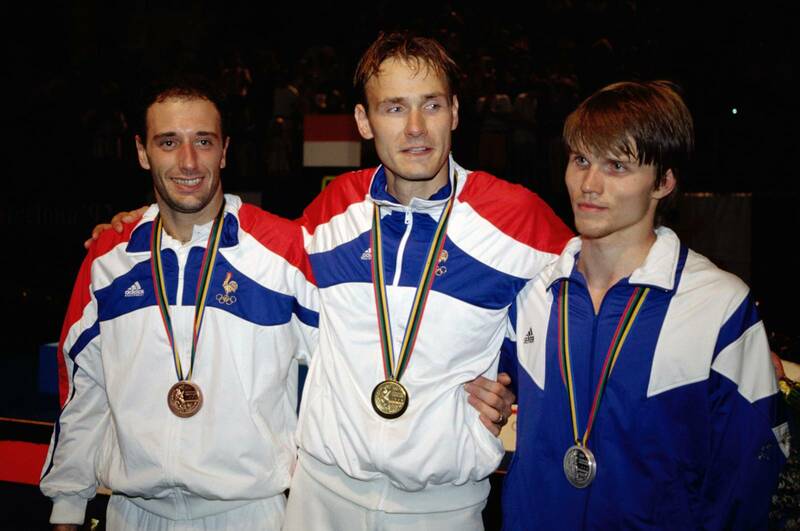 The bronze was regarded as a failure, although at that moment there were approximately four teams of equal strength – France, Germany, Italy and the Soviet Union. -And in Barcelona you represented the CIS, didn’t you? - As I look back on those days, I realize that the combined team might have been absent from the Olympics altogether. At that time, though, we felt no doubts we would be there. To an outsider it looked rather strange – a team without a flag and a country without an anthem. - In some respects it looks like the status of Russian athletes in London. - I wouldn’t say so. This time our guys knew that there was Russia behind their backs to support them. In Barcelona, everybody was in utter confusion. The Soviet Union was no more. The future looked obscure. It was the last time we all competed together – Ukrainians, Georgians, Armenians… Only the Baltic republics had broken away already. In the individual tournament I placed second to have lost the final fight to Eric Srecki, of France, although I was doing very well. I seldom watch the videos of my old fights. Just recently I came across that video on the Internet and sat down to watch it again. Now, a quarter of a century later I cannot but feel amazed at how I managed to lose it! Eric was an old-time rival of mine. We took turns winning major international contests. In Barcelona it was his turn to win… Srecki’s technique was always inconvenient to me. Each time I had problems with getting used to it. I lost the first fight by 5 points to 6, although at first I was in the lead and fencing was easy. Then I made a mistake. That miss made me nervous. I lost concentration. Without that it is hard to achieve the desirable result. - Were you very upset? - Why, naturally. And do you know what happened then? All the busses that took athletes to the competitions and then back to the Olympic Village were equipped with TV screens showing the highlights of the just-held contexts. The scene of my defeat was included in that video newsreel… Seeing a close-up of one’s own upset face on the screen was an experience too hard to bear… I managed to live through this, too. 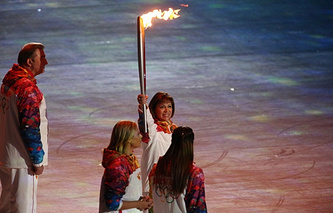 The team won the bronze, and it was dramatically different from what happened in Seoul. One year earlier the team won the world championships, but the bonus was never paid to us. In defiance of the firmest promises made to us. The future of the bonus for the Olympics looked uncertain, too. For the gold we would have been paid $3,000. The bronze was worth $1,200 – a decent reward in those days. I remember we held a meeting and asked for a clear response from the chiefs of our delegation in Barcelona… Some of the team’s members were from Ukraine. They knew well enough: should they go to Kiev after the Games, they will never see their money. In a word, the situation was somewhat different from true sportsmanship, but eventually we managed to brush everything aside and make a decent performance on the strip. The bonuses were paid to all. Six months later. - And how much were you paid for Seoul? - About $350, as far as I can remember. In the current realities the reward looks laughable, doesn’t it? But we never placed money above everything else. You have my word for it. There was something else we were fighting for. A medal, a place on the podium, respect of our colleagues and fans and the prestige of the country meant a whole lot more. You come home and you are welcomed like a hero…That’s something no money can buy! - And in Atlanta in 1996 you represented Russia, didn’t you? You come home and you are welcomed like a hero…That’s something no money can buy! - Yes, for the first time at the Olympic Games. By that time I had gained good shape. I’d won two world championships. And my age was optimal – 27. I felt time was ripe for grabbing the Olympic gold. Four months before the Games I went to Switzerland for training. I chose a highland area on purpose, hoping this would help me achieve the best form on the eve of the Olympics. It was a big mistake. I trained all day long. I made my body work at full capacity, but the condition was getting worse. Whatever I tried, nothing worked. I felt I was unable to make proper hits and my form was deteriorating with every passing day. I should’ve stopped and made a pause then and there, but I preferred to load myself more and more. I made myself work so hard that I even suffered an injury. My own experience was not enough and there was no by my side capable of giving me the correct advice. In the end I arrived in the United States in an appalling condition and in the individual tournament I failed to enter the top eight. 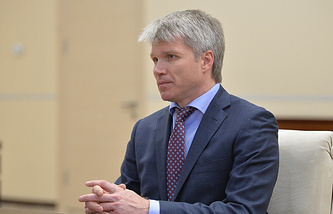 The team’s coach took a brief look at me and said: “Listen, Pavel. Don’t show up in the gym until the team events.” And he would bar me from all further training sessions. The next five days I spent listening to music, playing computer games, taking strolls about the city and having a good sleep at night. Then, when I resumed training I felt myself quite differently. The team was moving on quite well until the final round. We beat the French and the Hungarians, although we’d lost to them several times before. By all odds we were to outperform the Italians but eventually lost by a couple of hits to end up second.